In recent years there have been discussions and finally the decision made by the government and builders alike to use so-called ‘Brownfield’ sites to build affordable homes for those who want to take their first tentative steps onto the property ladder. Brownfield sites are sites that have been initially used for a different purpose to the one they will be used for when new homes are built upon them. Simply put Brownfield sites are sites that have one perhaps been used to grow crops or have been used to build homes on previously and as time has passed these homes have been taken away thus leaving the land empty again. Brownfield sites are often sold for less than they would have done if they had never been used and in some instances these sites have been contaminated, not by anything that would cause any harm or damage to humans but by contaminants that would make it difficult if not impossible to grow crops or graze livestock on. This is why the land is sold cheaply. How Does Brownfield Building Help the Housing Problem? At the present time there are more people than there are houses for them to live in and the use of Brownfield sites is designed to try and redress the balance. The government have recently passed legislation that says more affordable homes should be built so that those people old enough to buy a home should be able to do so. However as you may well be aware there are a lot more younger people around today than there were say twenty years ago which means that the number of houses required is fast growing beyond what the government can hope to build. To this end previously untouched Brownfield sites are being utilised so that local authorities and private building contractors – in conjunction with Housing Associations – can build homes that more people have the chance to afford. 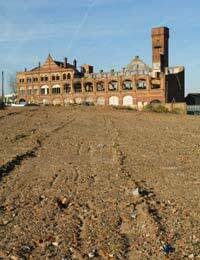 Is Building on Brownfield Sites Safe? In theory yes it is however – as we have touched up on already in this article – there can be a problem with contamination: for the most part though this contamination is confined to the growing of crops or keeping of livestock. The other major underlying problem with Brownfield sites is that the owners of the site can set the price they want for the land too high which means that neither the local authority or private contractors are willing to pay. To this end the land can stand barren for a long time until agreement is reached or until the seller reduces his or her asking price and comes into line with a figure that the buyer is prepared to pay. All Brownfield sites are checked and double checked and surveys carried out before they are purchased by local authorities or private contractors to ensure they are (a) safe to build on and (b)are not likely to suffer the effects of any prior contamination in later years. How Many Affordable Homes are Being Built on Brownfield Sites? At the present time the government has projected around 3,000 new affordable homes to be built by 2012 in the United Kingdom. It is worth noting that not all of these homes will be built on Brownfield sites but there will be a percentage of them that are. For more information on the building homes in your area you should contact your local council who will be able to provide you with details of how many homes are being built and in what areas.